This is the ultimate beginner’s guide to blending essential oils to make your own perfume. 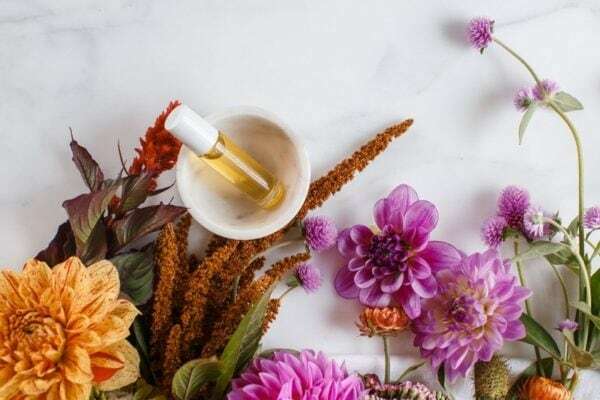 Get to know the various essential oil categories (citrus, spicy, herbaceous, woodsy, floral, etc) and how they complement each other, discover exactly what top, middle and base notes are, and how to blend them together for a perfectly balanced perfume. The beautiful thing about essential oils is that they can be used for purpose or pleasure – i.e., therapeutically, or as a perfume! And today we’re looking at how to create the most beautiful bespoke blends, consciously combining and layering oils synergistically from complementary categories, in ratios that give a complex and lasting scent. 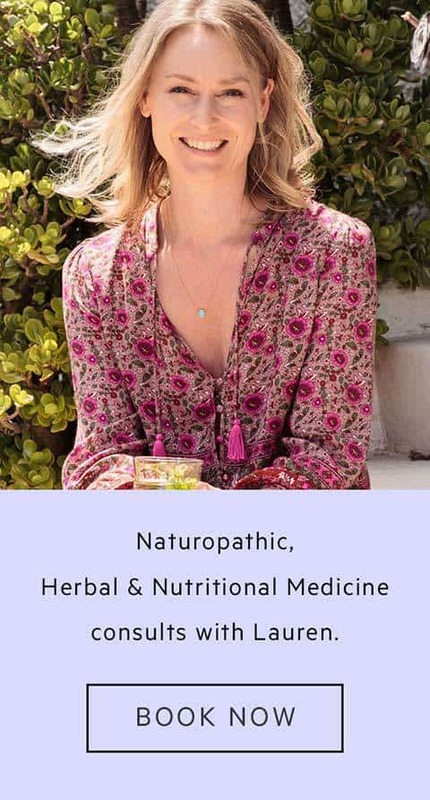 First of all – although I’m going to show you a few methods to follow here – there is no right or wrong way to do this – you can simply blend up a personal fragrance based on your own favourite scents – and away you go! But if you want to get into the nuts and bolts of it, then let’s make a start! Start with an intent – how would you like to feel? What type of perfume do you want to create? Romantic and floral? Sensual and spicy? Playful and fun? Starting your bespoke essential oil perfume blends with an intention helps set the compass so to speak. Think of the end result – how do you want to feel? What kind of a mood, feeling, emotion, theme or scent do you want to create? Is your blend to fit a season, a special occasion, or every day? Just start somewhere, you can refine as you go. I’ll go first – for the purpose of today – I want to create a signature summer scent – something uplifting, feminine, and happy. Essential oils can be loosely ordered into categories – I say ‘loosely’ as some fit into multiple categories. 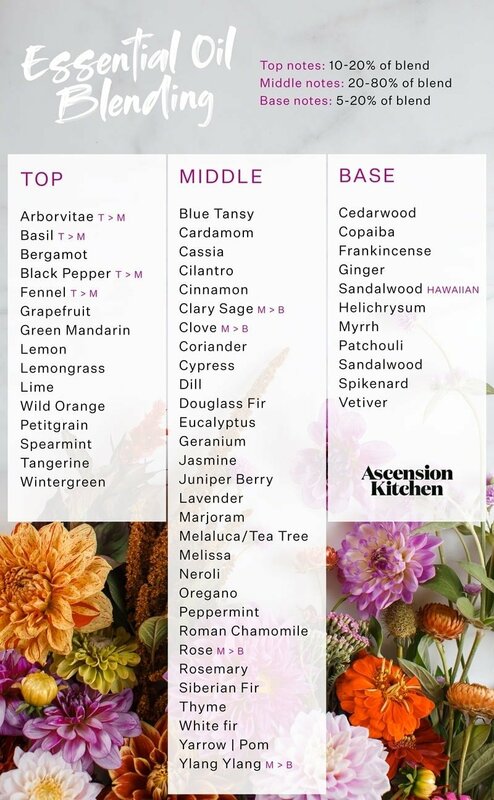 Once you have an idea of what you’d like to create, it’s easy to select appropriate oils based on their categories. For example, for my signature summer scent, I might look at the citrus and floral categories as a starting point. Floral oils tend to be soft, sweet and powdery. They can be nurturing, calming, passionate. Usually middle notes – and not often a category the lads are drawn to! Some oils have the ability to enhance the effect on each other when they are blended together, that is – they create a synergy. A synergy can be described as the whole being greater than the sum of its parts. Once you’ve identified a few categories, you can review whether they will be complementary in scent to each other. 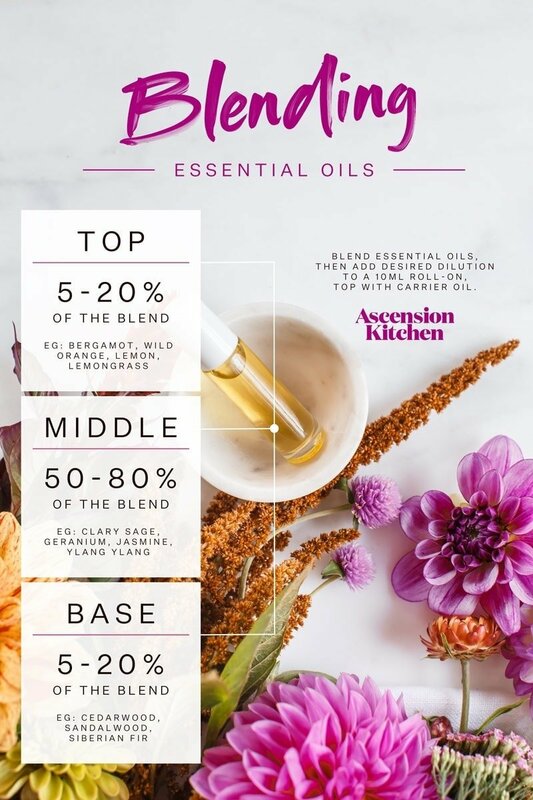 Now that you have a selection of synergistic oils, you can move on to create a ‘recipe’ for your blend. Perfumery is divided up into top, middle and base notes. How much to use of each? Start by blending up a small amount to see if you like the scent, 5 drops total is a good start. If you’re happy, you can multiply out as needed, however if you’re using a 10ml roller ball for your perfume, 9-10 drops is a 3% dilution which is safe and appropriate for adult daily use. Nearly there! Oils should be diluted before applying to the skin, but before we get into dilution ratios, you’ll need to pick a carrier oil. For most applications, I recommend doTERRA’s Fractionated Coconut Oil, as it is lightweight, scent free, and non-greasy. Feel free to use apricot, jojoba, macadamia nut oils – they’re all good options. I wouldn’t suggest almond oil as it could interfere with your desired scent. If you’re after a vanilla undertone, you could try infusing your own carrier oil with whole, sliced vanilla beans for 4-6 weeks (then strain ready for use). Follow a dilution chart to ensure you use the appropriate amount of essential oils to carrier oil. Generally speaking, a 2-3% dilution is safe and appropriate for everyday use on the skin (adults). doTERRA suggest you can go as high as 1 drop of essential oil to 3 drops of carrier oil. I suggest sticking to a small surface area of skin when using oils at this ratio, such as your pulse points. Further, please avoid these higher dilutions in vulnerable groups such as children and the elderly. Remember what we said at the beginning? There are no rules! These are fun guidelines to experiment with, but at the end of the day, if you like a blend of oils that are seemingly random – go for it! You may even prefer to wear just one. I love Blue Tansy solo – epic! Because we’ll be using essential oils topically, on your skin, you’re going to want to ensure they are the absolute best quality and potency. This is why I trust and stand behind doTERRA. Their stringent third party testing (via APARC) is published as a report available for the public to see – so we have full transparency with every single batch produced. 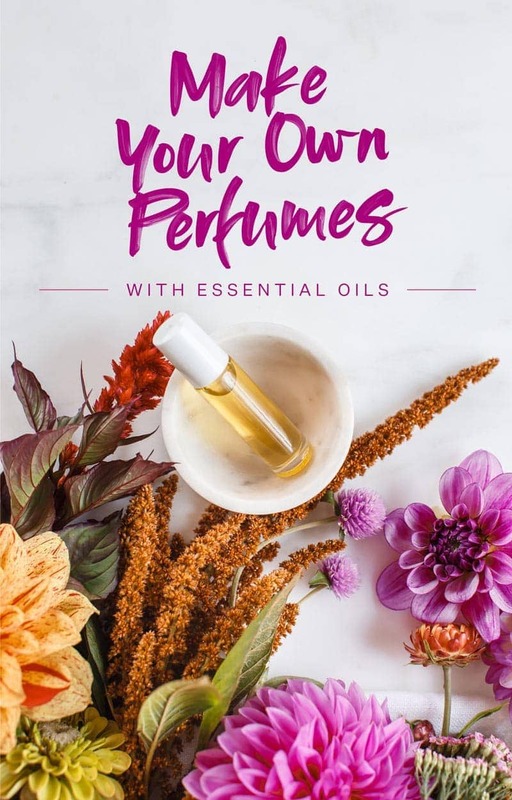 The best way to get started with them is to purchase a kit, which waives the membership fee and gives you a cost saving on a group of carefully curated oils. 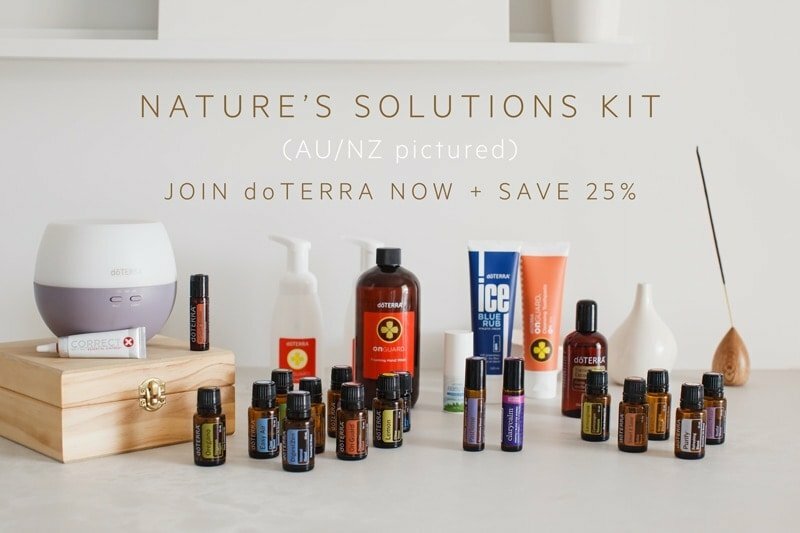 You can’t go wrong with the Nature’s Solutions Kit (Aus/NZ), which is known as the Natural Solutions kit over in the US. 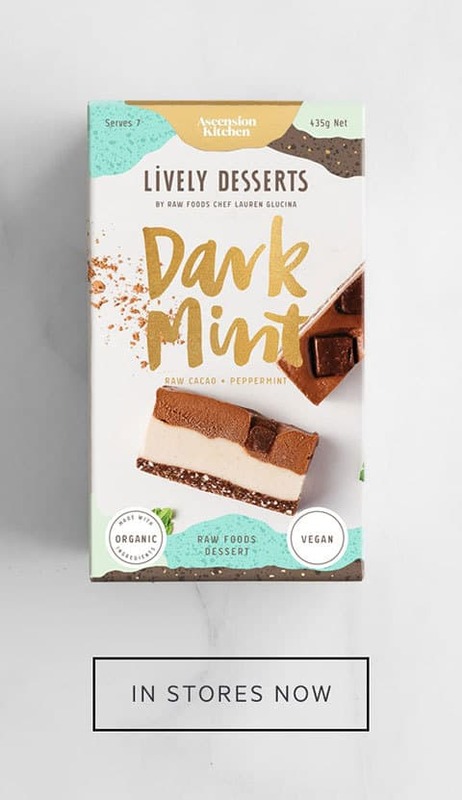 I’d love to invite you to join me in living a toxin free life, and enjoying the gifts these plant extracts have to offer. Buy doTERRA essential oils here. You can enrol yourself within minutes. Afterwards, I’ll be in touch to welcome you to the community and provide additional resources and support. Ok, hope you enjoyed that – please share your favourite blends below!